On February 26, the industrial director of the Rostec State Corporation, Sergey Abramov, declared that work on the fourth generation of the Ratnik future infantry combat system is underway. The system is said to include, among other advanced elements, a soldier’s exoskeleton as well as software link ups with micro–Unmanned Aerial Vehicles (UAV) and other systems utilizing artificial intelligence (AI) (TASS, February 25). The authorities claim that such military-industrial contractors as JSC Kalashnikov, High Precision Systems and Techmash have become Russia’s “locomotives,” driving the development and production of AI systems. Abramov concluded that “our [Russian] weaponry has always been, currently is and will remain the best in the world—without any unnecessary meekness and illusions regarding our competitors” (TASS, February 25). Increased precision of firepower, which will be achieved through a wide range of optical sensors (such as thermographic cameras, laser designators, rangefinders and optic-location complexes) integrated into the new system. 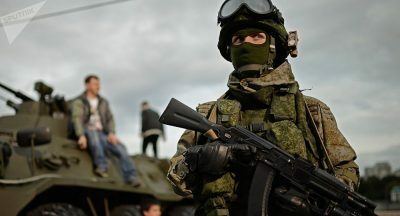 Murakhovsky, however, points to some notable problems that might not allow the Ratnik to be used to its full potential for at least some time. Namely, he mentions the issue of its internal battery, which can only work continuously for up to 2–3 hours without recharging. He stated that, to be truly effective, the system needs to be able to function for at least 24 hours (ideally, 48 hours, given the difficulties of accessing a power source in field conditions) without additional charging; only this will allow Russian forces to fully capitalize on the qualities of this upgraded system. More recently, the Russian side has announced that work on PTM-5 “smart mines” equipped with AI will be launched sometime in 2019. These mines will reportedly be capable of distinguishing between civilians and military forces rather than automatically exploding in either case, which is meant to considerably decrease civilian casualties in conflict zones. At the same time, AI will enable the mines to “choose targets in an independent mode” (Rossiyskaya Gazeta, February 26). According to Rostec Director Abramov, these new types of weaponry will secure “the superiority of Russia’s weaponry and munitions in comparison with any potential enemy” (Newizv.ru, February 26). bioengineering, biosynthetic and biosensor technologies. A strong link between academia and the Armed Forces. The MIT ERA is to become a highly sophisticated combination of laboratories, engineering centers, and “open spaces” equipped with the most up-to-date equipment specifically designed for promising military scholars and members of academia. A strong link between theory and practice, meant to include all stages of the product generation cycle, from idea generation to practical limited-scale testing. In effect, there is every reason to believe that AI is likely to soon assume a key role in terms of projects carried out under the umbrella of the MIT ERA. This was clearly indicated on November 22, 2018, when Putin, speaking on the grounds of this future technology park, specifically urged the Russian military to expand development of “smart weaponry” equipped with AI-based systems (Izvestia, November 22, 2018). Yet, this optimism is not shared by all experts in the field. For instance, in a paper published last autumn by the Russian International Affairs Council (RIAC), Sergey Karelov (the founder of Witology and the head of the League of Independent IT Experts) argues that “all countries, with the exception of the [United States] and China, are outsiders in the rush for AI technologies… [E]ven such technologically developed states as France, Germany, India and South Korea, whose technological development is incomparable with countries of the third world, are looking into becoming AI-colonies.” In contrast, Karelov’s report pointedly names Russia a “special outsider,” which has the potential to join the rush for global leadership as long as Russia’s industrial base is able to combine “the principle of asymmetricity with still-present intellectual traditions of the Soviet science” (Kommersant, November 6, 2018).